So You Want to Ride in Europe? Image of the Day: Wine Country! Cyclosportives - you can do it! Where is the best cycling in the French Pyrenees? You have a choice of cycling in France. The most popular areas for cycling in France are Bordeaux, Pyrenees, Massif Central, Provence, Grand Bornand, Alpes, Northern Alpes, and the Loire Valley. Here we help you plan for cycling in the Pyrenees; which is one of our favorite areas to bike in France. 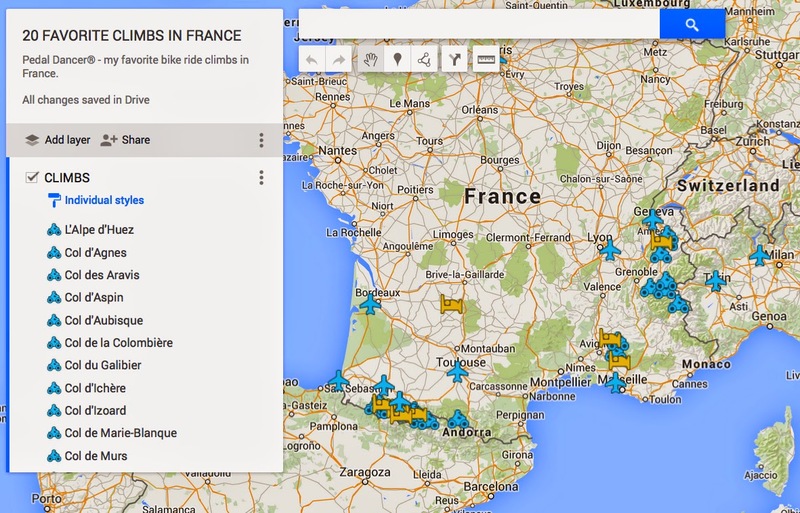 What are the best bike routes in France? The best cycling routes combine the best towns, climbs, descents, roads, hotels, restaurants, areas of interest, and accessibility. Whether you prefer to stay in large cities, small towns, or rural countryside you can find it all in the Pyrenees. The mountains of the Pyrenees is home to some of the most famous cycling cols and climbs in the world. The roads are well maintained, well signed and the auto drivers quite considerate. You will find a range of comfortable from 4* hotels to rural gites or camping. To experience even one of these climbs on a bicycle will be memorable and well worth your visit. The climbs are distributed across the Pyrenees mountain range and would be difficult to complete in one trip, but we do try to highlight the cycling climbs within each of the Cycling Travels 5 groups (below). For a classic Pyrenees biking experience we recommend starting your first trip to the Pyrenees with Group 3, then Group 2, Group 1, Group 4, and then Group 5. If you have 3-5 days in the area you will get more out of a quick trip to Group 3. If you have 7-10 days you might try to visit both Group 3 and Group 2, and perhaps Group 1. If you have 2 weeks or more you will be able to visit two to three of the Groups. With 3-4 weeks or more you will likely ride three-four groups, and take a side trip to Provence or Paris or fly to Italy or Spain and back. Valleys of the Pyrenees - Let’s start by dividing the Pyrenees into 5 Ride Groups from West to East. Included below are the popular Cols within each group (*cols are the Classic Climbs; as mentioned above). It is best to divide the bike routes in the Pyrenees into sections (groups). Within each group we target nearby towns, where to stay, where to ride, how to get there, and what else to do while there. For more details please visit the Comparison and How to Decide sections of this website under Where to Ride. Cols: Col Bagarqui, Pic des Escaliers, Col d’ Arnosteguy, Pic de Guilhers, Col Hourcere, Col de la Pierre St Martin, Col Erroymendi, Col de Ignace, Col d' Ispeguy, Col d’ Haltza, Col du Landerre, Puerto (Port) de Larrau, Lescun/L’Aberouat, Col de Soudet. Airport: Bilbao Airport, Biarrits Airport, Pau Airport. Towns: Pau, Oloron Ste Marie, Arudy, Laruns, Bielle. Airport: Bilbao Airport, Biarritz Airport, Pau Airport, Tarbes, Toulouse. Activities: Hiking: Pic du Midi d’ Ossau. Driving: Valle d’Aspe, Valley d’Ossau, River Rafting. Towns: Lourdes, Tarbes, Argeles-Gazost, Cauterets, Luz St Sauveur, Bagneres de Bigorre, La Mongie. Cols: *Col d’ Apsin, *Horquette d’ Ancizan, *Col d Pyresourde, *Col de Portet, *Pla-d-Adet, *Superbagneres, *Col du Portillon, Port de Pierrefite, *Port de Bales, Col de Mente, Col de Portet d’ Aspet, Col d’Aret/Col de Val Louron-Azet. Cols: Col de Portet d’Aspet, *Port de Pailheres, *Plateau de Bonascre, *Plateau de Beille, Col de la Crozette, Col de la Core, *Col de Port. Ride Group 3 - Warm-up: D26 between Lourdes and Bagneres-de-Bigorre, D920 to the Cauterets for lunch. D26 –D84 loop of Col des Palomieres east of Bagneres-de-Bigorre. Ride Map 3.2: Luz-Saint-Sauveur (water), up *Luz Ardiden down small road, D921, D13, Ayros, up *Hautacam, continue up Col de Tramassel, down to Argeles-Gazost (food/water), D10, St Savin, D13, D921, Luz-St-Sauveur (food/water). Ride Map 3.3: St-Marie-de-Campan(water), D918 up Col d’Aspin, down to Arreau (food/water), D19 to Ancizan, D113 up Horquette d’Ancizan, down D918 to Saint Marie-de-Campan (food/water). Ride Map 3.4: Argeles-Gazost (water), Gez, Col de Spandelles, Ferrieres, Arbeost, D112, Col du Soulor, D918 Col d’ Aubisque (food/water), (option Eaux-Bonnes to Laruns food/water)) Col d’Aubisque, Col du Soulor, Aucun, Argeles-Gazost (food/water). Ride Map 3.5: Lestelle-Betharram D937 to Nay, to Bourdelttes, D936 to Rebenacq, N134, D34, Buzy, D920, Arudy(food/water), D918 St Christau, (option: D91 Issor, D241, Lourdios-Ichere, D241 Col d’Ichere, Pont Suzon, N134,) Escot, D924, col d’ Marie Blanc, Bilheres, D934, Louvie-Juzon (water), D35, D126 to D226 back to Lestelle-Betharram (food/water). Ride Map 3.6: Bageneres-de-Bigorre (water), D84, Col des Palomiers, to D826 to D26, Col de Coupe, to Heches, D929 to Arreau (food/water) D918 Col d’Aspin, St Marie-de-Campan (water), D8 to Bageneres-de-Bigorre. Ride Map 4.1: Arreau D618 Col de Pyeresourde down to Bagneres-de Luchon, up D618 Col du Portillon, back down Bagneres-de Luchon, (option up Valle du Lys D46 to Superbagneres and back), Bagneres-de Luchon (food/water), D618 over col de Pyresourde back to Arreau. Ride Map 4.2: St Lary Soulan D25 to D 19 to D25 to Borderes-Louron, Clo de Peyresourde, D51 up Vallee d’Ouiel to Port de Bales top, down to St Aventin, to Billiere, to D76 side road to Portet du Luchon, Col de Pyeresourde, to Estarvielle, to Loudenvielle, to Genos, ValLouron, GR10 to Col de Val Louron-Azet/Col d’ Azet, Azet, down to St Lary Soulan, (food/water). Ride Map 4.3: Arreau D918 Col d’Aspin, St Marie-de-Campan, D8 to Bageneres-de-Bigorre (food/water), D84, Col des Palomiers, to D826 to D26, Col de Coupe, to Heches, D929 to Arreau. Ride Map 4.4:Arreau D918 to Col d’Aspin (option Horquettes d’ Anicizan), St Marie-de-Campan (water), D918 to La Mongie, to Col du Tourmalet, back down to La Mongie (food/water), back over Col d’ Aspin, (option: Horquette d’Anicizan decent) return to Arreau. Ride Map 4.5: St Lary Soulon, Vielle-Aure up D125 Pla d’Adet, (water at junction), up to Col de Portet, (option up D929 to Bge de Cap-de-Long, down D929, return to St Lary Soulon. Ride Map 4.6: Cierp-Gaud D44 across to St Beat, D44 Boutx, D85, Col de Mente, river, turn right on D618 to memorial of Fabio Casartelli, continue to Col de Portet d’Aspet, down to Portet d’Aspet (food/water), return back over Col de Portet d’Aspet, D618 Col du Buret, Juzet d’Izaut (food/water), Cszaunous, Col des Ares, St Pe-d’Aret /Loude (food/water), stay on D618 through Antichan-de-Frontignes, Fronsac, turn right before Chaum(!) across highway to D125, stay on D125 along hillside back into Cierp-Gaud (food/water). white (small) or yellow (medium) roads highlighted with green, are the most scenic routes. Avoid the large roads. Please read more travel tips about traveling in France with a bicycle on the FRANCE TRAVEL page on PedalDancer.com.